Written by Dave Mamet, directed by Brian De Palma, music by Ennio Morricone, and starring Kevin Costner, Sean Connery, Robert De Niro and Andy Garcia; The Untouchables is a stellar crime drama with talent to spare on both sides of the camera. 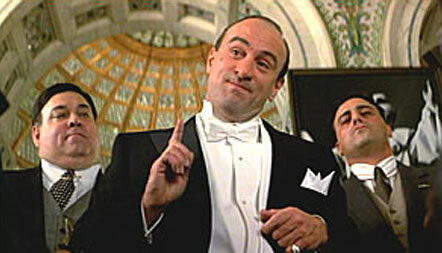 Only loosely inspired by real events, The Untouchables is set in the Chicago of the early 1930s: Al Capone (Robert De Niro) effectively runs the town, his empire drawing enormous wealth from control of the illegal alcohol trade and destroying any and all opponents with an iron fist wrapped around a Tommy Gun. With all local officials and the police force on Capone's payroll, Federal Treasury Agent Elliott Ness (Costner) is dispatched to Chicago on a mission to put an end to Capone's reign. He teams up with beat cop Jim Malone (Connery), trainee sharp shooter George Stone (Garcia) and federal accountant Oscar Wallace (Charles Martin Smith). After initial set-backs, the foursome succeed in disrupting Capone's operations, capturing or killing many of his men and seizing illegal alcohol shipments. Attempts to corrupt Ness and his team fail, and they earn the reputation as untouchable. With his empire threatened, Capone fights back. The Untouchables is a high speed trip through the wild streets of a lovingly recreated and crime-infested Chicago. With a streak of mean humour embedded deep within all the violence, Mamet's script never lags, and reaches several breathtaking highlights, artistically delivered by De Palma: Ness and his men raiding an illegal alcohol deal at the Canadian border, with Malone subsequently torturing a corpse for good effect; Malone attempting to fend-off assassins at his apartment earned Connery the Academy Award for Best Supporting Actor; Ness and Stone capturing Capone's well-guarded bookkeeper at the epic Union Station shoot-out is an all-time classic scene. And the final rooftop confrontation between Ness and Frank Nitti, Capone's most lethal henchman, is a satisfying end to the carnage. 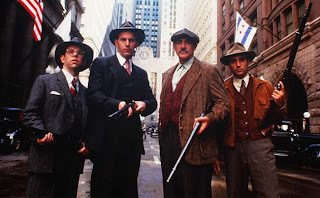 With The Untouchables setting its sight firmly on capturing the spirit rather than the reality of an era, Connery and De Niro deliver the flashy performances while Costner and Garcia anchor the rest of the cast. All the actors are to varying degrees over-the-top, but in the context of a movie brimming with kinetic energy, exaggerated performances are what was needed to avoid being overwhelmed. Morricone weaves his spaghetti western themes with a 1930s mood to provide an evocative soundtrack to the proceedings. Elliott Ness memorably got his man; The Untouchables stylishly got all the necessary details right.